"The Tories would need a swing of around 7% to win the next election outright. The 3% swing they have enjoyed since last May would probably be enough to deprive Labour of its overall majority, but would still leave it as the largest party." That’s the Guardian’s conclusion as the newspaper digests the findings of its latest ICM poll. 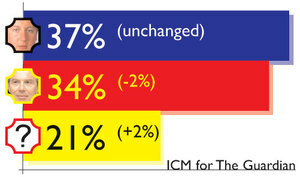 The Tory lead has risen to 3% because of shifting of voters between Labour and the LibDems. Support for Britain’s third party has begun to recover from the post-Oaten, pre-Dunfermline lows of January. The Guardian suggests that "the findings are likely to reassure Conservatives concerned that Mr Cameron’s attempts to reform the party could alienate traditional supporters without attracting a substantial number of new voters". That is certainly the concern of Robin Harris, Mrs Thatcher’s former speechwriter. As BBCi reports, Mr Harris believes that David Cameron has "systematically repositioned the party to the left", giving the impression that he wants to turn it "into an institution with no obvious purpose other than to ape New Labour."